Groundwater systems, especially karst groundwater, can seem confusing. Most of what you learn in school about groundwater tables, long water residence times underground, the amount of time it takes for water to move underground and back up again, and the natural purification of water through natural filtering simply doesn't apply in a karst system like springs. This page should clear up some of those misconceptions. If you're going to understand groundwater, you first need to understand: for nearly every rule, there is some circumstance which is an exception. It's not very safe to pontificate about groundwater! Water in all locations, whether above or below ground, follows basic physical laws, in that under atmospheric pressure it flows from areas of higher altitude to lower (water flows downhill) and from areas of higher pressure to lower (think your kitchen faucet versus the water in the cup you've filled). Water under pressure flows faster than water moving only via gravity. To make things complicated, under sufficient pressure, water can easily bubble up, gaining apparent elevation, such as what happens at a geyser or vaclusian spring. You need to remember, though, that even that water never rises above the elevation of its source, sometimes far away. How water behaves underground is influenced by the material it flows through. In most places with a sufficiently wet climate, water permeates every nook and cranny underground, driving air from small spaces and cracks in solid rock, sand, gravel or soils and clay. This generalization does not apply in deserts. The distance down to water is quite variable. In swamps, groundwater is at the surface. In arid areas, it may be many thousands of feet. Only a few places on earth have truly dry rocks beneath them. Each of these earth materials have different porosities, and permeabilities. Porosity measures the amount of air space inside the material--permeability measures the interconnectivity of those spaces, to permit water to flow through. For example, a bouncy rubber ball can have high porosity--have lots of self-contained bubbles--but low permeability--few of the bubbles are connected, and the inside of the ball stays dry and floats if tossed in a tub. A sponge has both high porosity and high permeability, giving it the ability to both hold and transfer water easily. Some filters have low porosity, but high permeability, restricting the materials which can pass through via controlling the size or number of the pore size. There are three major kinds of groundwater systems--conventional, coastal, and karst systems. 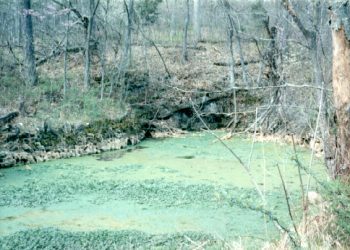 Missouri is underlain with a mix of conventional and karst groundwater systems. Both systems can exist even in one location, but at different depths. Generally, the first several hundred feet from the surface down is used to classify a watershed as conventional or karst. CONVENTIONAL SYSTEMS exist beneath much of the earth's surface. In them, water is uniformly distributed more or less evenly beneath the entire region. After making allowances for tilted rock layers, permeable or impermeable layers, and topography (water is usually closer to the surface beneath valleys, and further away under hills), water will be found at nearly the same elevation above sea level by a driller at one home, and another a mile away. Groundwater may be though of as being resident in a sponge in these systems. A permeable sandstone layer will hold more water than the granite it overlays, and a gravel layer in a river bottom will hold more than either. Without pumping, water in conventional systems moves very slowly downhill, if at all. COASTAL SYSTEMS are similar to conventional systems, with the added complication that fresh water is lighter than salt water. Brackish water sometimes exists inland, however in coastal areas, fresh or saltwater lenses may co-mingle, and in some cases, nearby ocean water may exist for several miles inland, beneath fresh water brought by a river. Missouri has brackish and saline waters, but has no coastal systems. KARST SYSTEMS are dynamic, with much surface water/groundwater interaction. Water may enter through a sinkhole, or via slow percolation from the surface, but once it reaches soluble rock, it dissolves and erodes a path for itself, given a tiny opening of some sort to work with. Many soluble rocks, like limestone and dolostone aren't that permeable--the water moves through spaces around the rock, such as joints, bedding planes or high porosity layers such as high permeability sandstones. Water is further directed by the existence of other low permeability rocks like shale layers. Channels are opened by chemical dissolving, erosional corrasion, and collapse from unsupported layers. These processes can be amplified in places where water is under pressure--driven either by steepness of fall, or the sheer weight of water behind the opening. For more about karst systems, see A Karst Hydrology Primer. P.S. Even though karst groundwater processes do contradict many things your teacher may have told you are incorrect about groundwater, they were correct on one point: there is no supernatural way to find water with the use of twigs, welding rods, pendulums, or other devices. Knowledge of a local area, some geology, some hydrology, shrewd deduction and some sheer luck make for good results in finding groundwater when siting a well, not magic. This page last updated on April 5, 2007. Return to Missouri Springs homepage.